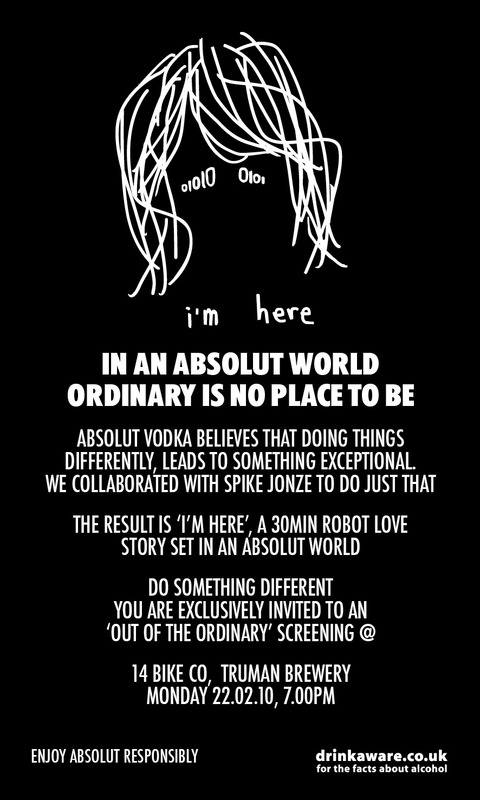 At the party on Sunday we showed the trailer to the new Absolut commissioned Spike Jonze short. I’m super excited to be organising the screening of the entire film on Monday 22nd Feb in 14 Bike Co.
Spike Jonze is a total legend; not only did he make some of the best music videos and skate movies ever (I have always loved ‘Mouse’), but he also directed Being John Malkovich and more recently, Where The Wild Things are. You’ve gotta come down to the store and check it out! We’ll be having two screenings; one at 7pm and another at 9pm. RSVP and let me know which one you’d prefer and I’ll do my best to accommodate you.